The ratiotec brand stands for competence and quality. High development competences, as well as especially high requirements for manufacturing quality characterize the German company. According to the company motto »Trust is good – ratiotec is better« - with ratiotec we offer every one of your customers the suitable solution for smooth and secure handling of cash. Since its founding, the company headquartered in Essen has been developing innovative products for secure handling of money. The product range includes high quality test devices for immediate detection of counterfeit money, high performance bank note counting machines, as well as reliable coin counting and sorting machines. 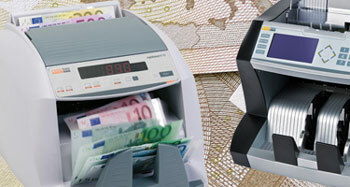 All devices are regularly checked for security and certified for automatic testing of bank notes. Many prominent companies from diverse branches, among others banks and savings banks, as well as car dealerships, gastronomic businesses, chemists’ shops, bakeries and super markets, are already included among the satisfied users. As provider, using ratiotec hardware you ensure reliable and high-margin products for your customers. Through the sophisticated design each user immediately and intuitively handles the products – expensive training or time-consuming instruction is unnecessary in most cases. This saves your customers time and money and is only one of the many selling points for ratio hardware.